Here a look at the inside of the new B58 6 cylinder,,,,as you can see the vanos units and timing chain are at the rear next to the firewall,,,,,that will be a fun job when the time comes,,,the cylinder head is more stream line,,,,the ins are more simpler,,,,the eccentric motor is now outside the cylinder head it is sitting at the top front of the engine next to the intake manifold. This entry was posted in Uncategorized and tagged B58 engine. Bookmark the permalink. 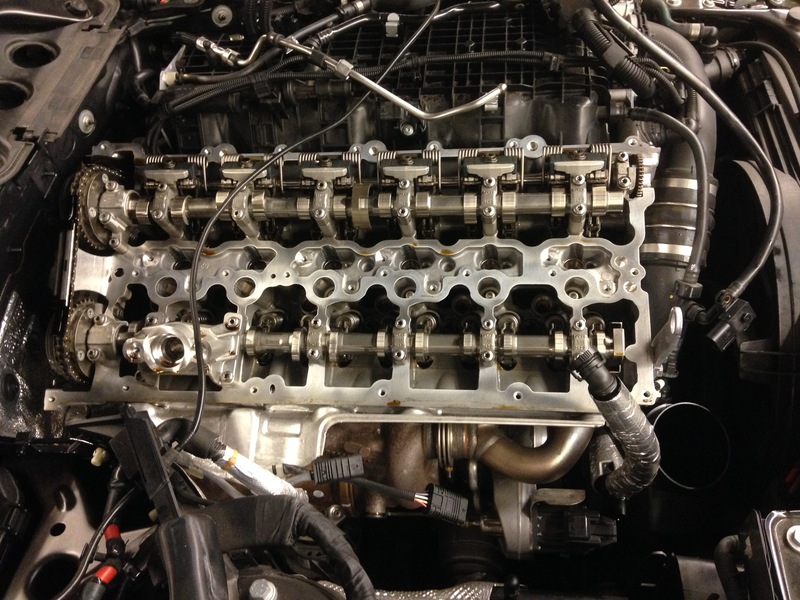 The location of the timing chain on these B-series engines is the #1 reason why I’m trying to hold onto my N55. Yeah that timing chain location could be fine if it’s problem free, but if that motor is like the N20 they’ll have a lot of headaches. Any idea why they did that? Also, why was it apart? The B-series engines are modular which allows BMW to save money on costs with regards to casting the engine blocks*, and also realize savings on other associated component costs. * Closed-deck engine block and BMW uses the same block for both gas and diesel variants plus the cooling/lubrication passages are the same design so costs are saved when casting the I6 since it’s just an extension of two cylinders. I heard one explanation for the arrangement, not sure if that’s the right answer. The article said this way the engine runs smoother. It’s easier to balance it out. Andreas, I heard from several people that this engine in their car runs roughly and shakes the car due to miss firing after a cold start. It only lasts for a few seconds. Have you met with this issues? What could be the reason?